It was a death in the family 107 years ago. And it rocked The Legal Genealogist‘s kin. Perhaps not exactly today, though today does mark the 107th anniversary of the death. News of that death, you see, would have taken some time to travel from Red Lake in Colfax County, New Mexico, to Frederick, in Tillman County, Oklahoma. And it would have taken still more time for the news to travel from Frederick to Hollister, some 12 miles away, give or take a few. Yet, years after the event, the impact of that news was still seared in the mind and the memory of one person affected… my grandmother, Opal (Robertson) Cottrell. 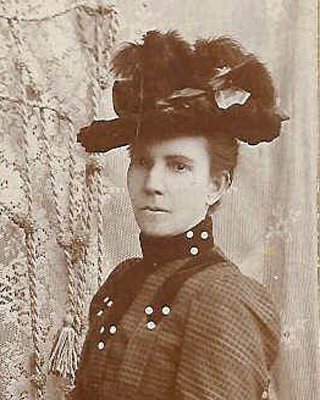 The death was that of my grandmother’s grandmother, Martha Louise (Shew) Baird Livingston, on the 9th of April 1909. Her father Daniel was a farmer who appears to have died when Martha Louise was a very little girl. We know he was alive in 1854, when he signed a receipt for a federal land purchase,6 but he was not recorded with the family in the 1860 census and there is no record of him thereafter. She was quite young when her first child, Eula, was born, in 1869, and there is some doubt as to the status of Eula’s parents at the time of her birth. In short, we have no clue whether Martha Louise and Jasper Baird were married — then, or ever. Sometime after Oklahoma became a state, Martha Louise became ill. Nothing that anyone could do for her in Oklahoma seemed to be helping. She couldn’t breathe. What was left to try to help her was what so many people at that time tried to do: Martha Louise was sent off to a better climate, to the desert of New Mexico, in the hopes that what was almost undoubtedly tuberculosis could be brought under control. We don’t know how the news came to Frederick, Oklahoma, where most of the Livingston family was centered. But we do know, exactly, how the word came to Hollister, where Eula and her family were living. We know because of a note written by Eula’s daughter, my grandmother Opal, on a page in a 1968 calendar. That may have just been what was available when she sat to write her recollections — not necessarily in 1968 — but whenever it was it had to be at least 59 years after the fact. Brings home how real our ancestors were. As genealogists, we know and appreciate their joys and sorrows. In talking to those who don’t research or even know their own family history, there is a kind of void. With the recent death of my own Mom, I can appreciate what your grandmother and the family felt. Thanks for sharing her story Judy. There were several men in my family named Abijah. In my experience this name can be misspelled or mistranscribed several ways. Could your Abigah be an Abijah? Spelling was rarely standardized until very recently, so anyone with that name could have spelled it either way — or Abiga or Abija or… (and sometimes more than one way in a single document!). In most cases, this man went by his initials A.C., but in the few records where it is spelled out, it is spelled as Abigah. That, at least, appears to be how his family spelled it.